By now, most consumers are familiar with social media. It is easy to track how many Facebook friends, Twitter followers and LinkedIn connections exist on an individual basis. This article will not serve as an introduction to social media but rather will focus on how real estate agents and marketers can improve or fine-tune already existing social media strategies to enhance their firm's web presence. Twitter, Facebook, dashboard readers and blogs are the most basic ways to secure and maintain a strong web presence. In real estate, the application of these instruments has great potential: How can social media make a business more relevant? Social media empowers consumers to ask more questions and be more direct; however, a social media strategy cannot be implemented blindly. In Social Marketing to the Business Customer , Paul Gillin and Eric Schwartzman provide insight on how to gain the biggest return on investment by implementing an effective social media strategy for your organization. Listening is often considered one of the most important skills needed to be successful in business. 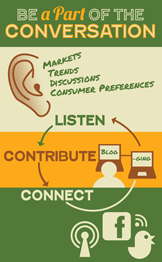 Listening to the conversations created through Internet communities is a great way to keep current on market trends and to stay informed about market expertise (which is also the result of and basis for effective blogging - see Think Point #2). However, with the torrent of information dispersed across the Web, accessing this information can be both labor-intensive and inefficient. A dashboard is the perfect solution to address this issue. A dashboard is a Web-based reader that allows the user to peruse, update, manage and monitor the content of numerous websites at once. Dashboards are analogous to what the TV Guide is to television, "grabbing" the web content that the user wants to monitor and displaying it in a centralized reader. Instead of wasting time browsing through Internet "favorites" tabs and visiting multiple websites, dashboards can aggregate industry-specific or keyword-driven content in one location, saving valuable time. Dashboards have become intelligent business tools, equipping users with customized access to daily news headlines, blogs, Twitter feeds, audio and video content. Dashboards subscribe to RSS (Rich Site Summary) feeds to deliver regularly changing web content to a customizable dashboard. Once a user subscribes to an RSS feed, the new content from that source (website) will appear automatically in a dashboard. Dashboards also give users the ability to update different social media from one centralized location. Currently, there are a variety of social media dashboards on the Web, including Hootsuite, Spredfast, TweetDeck and Google Reader. These dashboard programs offer a free basic service, which limits the number of RSS feeds a user can subscribe to, and premium services, which allow users to access additional features. Some premium services allow users to access Web analytical reports, to subscribe to an unlimited number of RSS feeds, and to set up separate accounts for multiple employees (if applicable). Go to Google Reader and either login with your current Google account or register for a Google account via the link provided. Click on the "Add a subscription" button to link to begin searching for relevant content. Users can search either by a specific feed URL (e.g. RISMedia's Real Estate Feed: https://feeds2.feedburner.com/rismedia/lgnb) or by keywords (e.g. "real estate" or "Boston real estate" for a local market). After adding feeds, all new content from these websites will populate in your Google Reader home page. One of the simplest ways to build Web visibility is by creating a blog. Blogging provides a way to connect with an audience in a specific area of expertise. But what should an agent blog about and how would someone differentiate the agent's blog from the seemingly numerous other blogs that exist? There are three general guidelines that will help initiate building a relevant blog geared towards professional audiences. First, new bloggers should start by focusing on a specific area of expertise. Find your niche and do not deviate. Countless blogs may exist about real estate trends, but there are far fewer that exist regarding the development of real estate technology. Focusing on a niche and being as specific (or concise) as possible will go a long way in delivering genuine value to the consumer. Over time, this area-specific expertise can help a blogger cement his position as a thought leader in his industry. Secondly, bloggers must be consistent, updating the blog periodically with quality and pertinent information. Derive a posting schedule and stick with it. This means dedicating time to writing, conducting research, paying attention to the market and studying trends. In order to further differentiate his blog from competitors', a blogger might consider revealing his trade tips and secrets. In the digital age, information is available to the consumer at the click of a mouse and audiences will judge blogs based on how much valuable information they can extract from it. By giving a little knowledge away, an agent can establish a reputation for being a credible source in his field. Lastly, blogs cannot be sales pitches. The point of a blog is not to sell products or services, but to establish a strong position in a specific field. Sales pitches do not translate well over the Internet and consumers will respond with disdain if they believe that a blog operates under the guise of a sales pitch. Once a blogger establishes himself as a visionary, educational and informative thought leader, results will likely follow. Lead generation is consistently a hot topic in the real estate industry. Lead generation through traditional, outbound marketing tactics such as print advertising, cold calling, and mass emailing is slowly being replaced by inbound marketing methods such as social media. Inbound marketing is often cheaper than traditional marketing tactics, more efficient and delivers a strong return on investment for organizations or individuals. In fact, Twitter and Facebook now have the potential reach as many, if not more, consumers than traditional marketing channels. By leveraging the benefits of the social media environments, prospective leads can be discovered quickly and organically. To convey the importance of understanding where consumers are in the purchase process, Gillin and Schwartzman outline five specific stages along the buying cycle. The consumer's stage in the cycle impacts how a salesperson should approach and inform the consumer regarding available products and/or services. The first and second stages of this cycle are Impression and Sales Lead. At these stages, prospects may read white papers, blogs, articles or listen to podcasts in an effort to gather general information about the field. Stages three and four relate to Quality Contact and Prospect. At these stages, prospects are more vested in the buying cycle and start to focus their search on gathering information through case studies, recommendations and word of mouth. The last stage in the buying cycle is where the prospect makes the final decision to become a Customer. Agents may connect with prospects at different stages of the buying cycle, so identifying and understanding where a prospect is in terms of the cycle is important. A prospect that arrives at an agent's website or blog after searching for a specific company name is further along in the sales cycle than one who arrives by searching for an agent generically (e.g. "Boston real estate agents"). Blogs, LinkedIn, Facebook, Twitter and YouTube are all powerful tools for effective social network prospecting. In this regard, consider that social media should target buyers at every stage of the buying process. For example, a blog or Twitter feed should have a balance of generalized and specific content: consumers in the Impression stage of the buying stages can access the general, industry information they require, but prospects looking to make the jump to the Customer stage can also gain the more specific buying information they require. A real estate agent may also choose to separate her blog or Tweets by content areas, such as home financing, open house experiences, or how to make an offer on a home. All of these strategies can help agents leverage their social media efforts to reach a broad range of consumers in multiple stages of the buying cycle. Listening, contributing, and connecting through social media marketing can have both short- and long-term impact in the real estate industry. Returns on social media investment may not be immediate, however social media continues to be a viable tool to propel individual and organizational business growth. Gillin, Paul and Eric Schwartzman (2011), Social Marketing to the Business Customer, New Jersey: John Wiley & Sons, Inc.
Dennis is a first-year graduate student from Boston, Massachusetts and is currently pursing an MBA in Healthcare Administration. He earned his BBA in Organizational Communications from Northeastern University in Boston, Massachusetts.